Since EPA’s 2007 emissions control technology regulations took effect on the production of diesel-powered engines, truck owners need to know how the process of regeneration works. This article will explore the ways to identify when a regen is necessary, how to regen a Freightliner with a Detroit Diesel engine, and additional information on after treatment systems. The first step is to identify when a regeneration (regen) is needed. The primary way to get updates on the status of your diesel particulate filter is to watch for error or warning lamps on your truck’s dash. The malfunction indicator lamp is a warning that part of the engine’s emission system is not working correctly. Detroit Diesel has stated that the truck can be driven to the end of the shift and is not a warning indicator that requires immediate attention. The HEST lamp is for high exhaust system temperature. 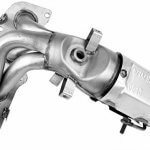 It means that the exhaust is at high temperature due to extra regen speed which occurs when the truck is traveling at low rates or is parked. If this lamp flashes it means that parked regen is in progress and that system temperature is not up to par yet. This warning light is merely to caution the operator to be careful around the hot exhaust system and to keep flammable materials or vapors at a safe distance. 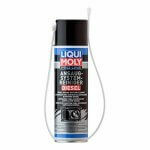 DPF lamp is the diesel particulate filter light and if it is stable then parked regeneration is required soon. If this light is flashing, then parked regeneration is needed immediately. 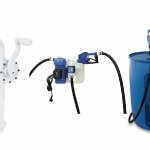 The other option here is to bring the vehicle to highways speed to enable an active regeneration of the filter. 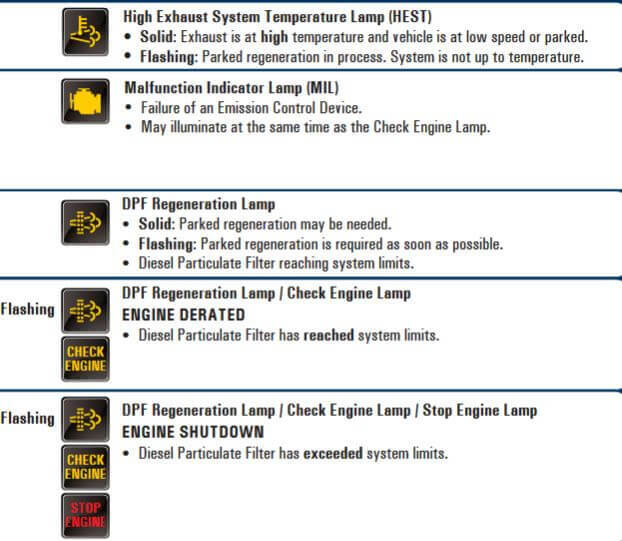 Furthermore, if the DPF lamp illuminates alongside the check engine and stops engine light, then that means the diesel particulate filter has exceeded system limits, and your only option is to perform a parked regeneration. If your truck is reaching its 500,000 miles or 10,000 hours mark, then it may even be time to replace the filter system altogether. Types of Regeneration: Active, Passive, Parked. Here we’ll discuss the three types of regeneration that can be performed and go into the specific details of how to conduct a parked regen of a Freightliner truck with a Detroit diesel engine. Active regeneration is the process of burning out the soot by raising the temperature from an outside energy source such as heated diesel fuel or the truck’s electricity. It only requires the driver to bring the vehicle up to highway speeds and no further action is needed. It takes about 40-45 minutes of highway speed driving to complete an active regen. Passive regeneration occurs when the truck can maintain right exhaust temperatures so that the DPF can self-regenerate itself continuously. Passive regeneration is mainly featured in vocational trucks that are intended for off-road use such as logging or oilfield vehicles. No action is required from the operator for passive regen to occur. Parked or stationary regen is when the truck cleans the DPF while at a standstill. If you’ve thoroughly read our above information on identifying warning lamps, then you should know when parked regeneration is needed and when you can do fine with the active option. Here’s how to regen a Freightliner using the parked/stationary procedure. Shift the transmission out of neutral and then back into neutral. 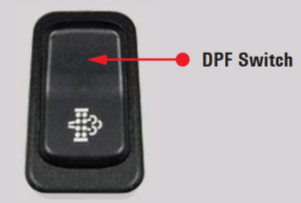 Hold the DPF switch to the ON position for five continuous seconds then let go. At this point, the engine speed will ramp up (RPM increase), and the DPF warning lamp will disappear. Make sure you do not push the key in the ignition to the off switch, depress the clutch, release parking brake, or put truck into gear. Any of these will stop the regeneration. 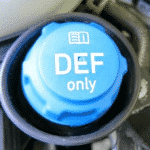 The regen has concluded when the engine returns to slow idle, and the DPF light remains out. 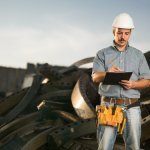 Remember, exhaust temperature increases during regeneration, so it is essential that this procedure is performed outside and away from flammable or combustible materials. Hopefully, you are now educated enough on how to perform a parked regeneration. If your truck has reached the 500,000 miles or 800,000-kilometer interval and a check engine light illuminates on your truck’s dashboard, then it may be telling you that manual ash must be removed from the DPF. 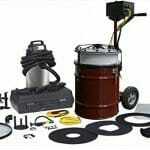 This means you or a mechanical technician needs to remove the DPF filter for manual cleaning. 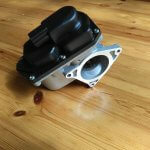 Often you will need to replace the DPF filter entirely along with the diesel oxidation catalyst (DOC). 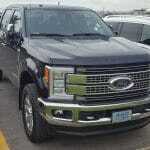 This interval may occur sooner depending on your truck’s engine model/make/year. Moreover, be informed of DPF filter cleaning methods and avoid the “bake & blow” procedure that blow compressed air into the DPF substrate to remove loose ash. Sometimes thermal baking is used to burn off hydrocarbons clogging the filter. 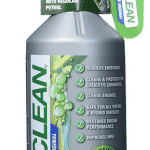 However, these methods are not correct cleaning methods and can damage an after-treatment system. The Environmental Protection Agency put engineers at Detroit Diesel in a position of little choice regarding meeting its set-out regulations. 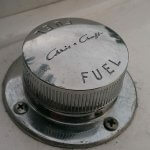 However, while the early technology for controlling emissions may not have been the most reliable, newer models have improved significantly regarding fuel efficiency and maintenance. 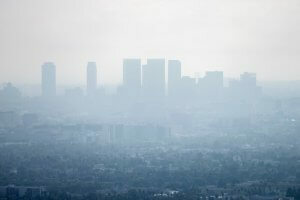 Look at the image below and see how countries such as China who have less strict pollution laws appear. Do you want to wear face masks to breathe freely because air pollution levels are too high? 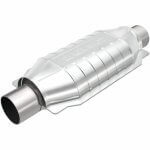 Follow our advice and DO NOT DPF DELETE!